After yet another sleepless night spent tossing and turning, half asleep but mostly awake, I woke up around 4 am and couldn’t fall back to sleep till 6 am so I decided to get up and get ready for breakfast. We booked the Alcatraz tour from 8:45 am so after a quick breakfast at iHop again (yummy whole wheat pancakes with banana but I couldn’t finish it, the portions in the US are so huge), we headed straight to Pier 33 to board the boat to go to prison. Wow that did not sound right! The weather forecast gave us no good news for today and for the rest of the week but we hoped that the rain will stay away at least until we get back from the tour. We were wrong. As soon as we got to Pier 33 it started to rain heavily and the rain continued on and off the entire day. Anyhow, we arrived to the island and we had a nice walk in the rain to the cellblock building followed by a very interesting audio guided tour of the cellblock including the history of the island, of the prison and of the inmates. I even got to meet one of the inmates who was there for autographs and pictures, William Baker inmate no. 1259. Here are the pictures from Alcatraz. The rain got even worse as we finished the tour and it continued during the boat ride back to the shore. I thought that the breakfast will hold till evening and I will skip breakfast just like yesterday but I was actually ready for a small snack after the tour so we went straight to Hard Rock Cafe at Pier 39. 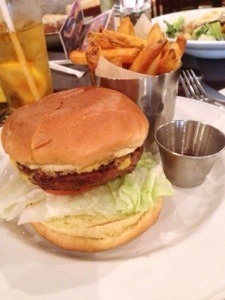 Not sure if I can call this burger a small snack but I was really in the mood for a burger. We also shared a fudge brownie, we were three persons and we couldn’t finish the portion meant for one person. We attacked the brownie so fast that I didn’t get a chance to take a pic of the brownie but imagine a huge cup with a large warm chocolatey fudgy brownie on the bottom topped with three huge scoops of vanilla ice cream and probably like 2 tubes of whipped cream. Repeat it after me: calorie bomb! Lunch made us pretty tired so we returned to the hotel for a short one hour break and I fought hard not to fall asleep because I knew that I won’t be able to go out again today. 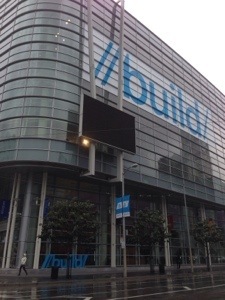 Registration for the Build conference opened at 15 pm so the plan was to walk at 15 pm to Moscone Center from our hotel at Fisherman’s Wharf to burn some of the calories from lunch. It was still cloudy as we exited the hotel but it wasn’t raining so we started our walk nice and easy to the conference location. When I have bad luck, it follows me all the way! So of course as soon as we started to walk the rain started again and it rained heavily the whole 30-45 minutes till we got to Moscone Center. I actually think that we took a few wrong turns on the way because the walk takes normally only 20 minutes. I already ruined my reputation yesterday with suggesting the wrong direction twice so I followed the group but you know how men are, they don’t ask for directions and don’t use maps. Needless to say that we were soaking wet by the time we got there so we quickly registered and picked up the badge and the session info and took the F tram back to the hotel to get a fresh change of dry clothes. After another short one hour break we are heading later to a geek party organized for the Build attendies at Pier 39 at Bubba Gump Shrimp. Tommorow is the first day at the conference, the keynote starts at 8:30 am so we need to leave from the hotel at 7 am to have some time for breakfast too. These have been two amazing days visiting San Francisco and the next three days will be probably as amazing if not even more, as I will be hanging out with some of the most awesome people from Microsoft and I get the chance to learn directly from them.